While on your summer travels, try to take a photo or two from a new angle. It's so easy to get caught up with posed photos of people, but don't forget the tiny details. In today's example, you'll see the photographer is sitting back allowing the viewer to see luggage, the tent and air mattress, and of course a beautiful view of the campsite. 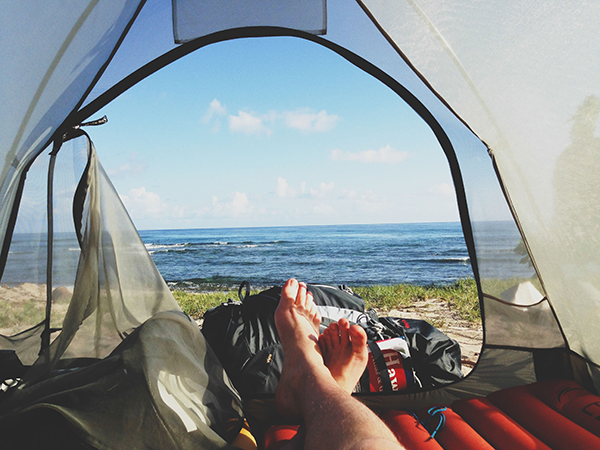 Recreate this image if you're planning a camping trip, but seek out other opportunities to capture your surroundings from a new point of view. Photograph your child or their room, including the door and entryway in your shot. Place your camera or phone inside the mailbox and use the self timer to take a photo of your family picking up the mail or peering inside. We can't wait to see what you capture! See more memory keeping prompts here.